for Soul Contact & Soulful Living. Ochagavia ( ock-a-garv-ee-ah ) are a thorny group of plants that bear the most exquisite, soft flower bracts. All species are terrestrial and have their roots firmly in the ground. The genus is named after Sylvestris Ochagavia, a former Chilean minister of education. 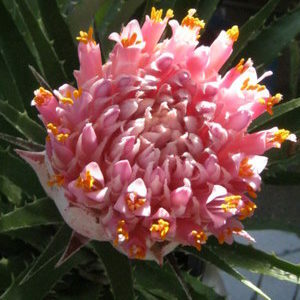 Ochagavia are native to southern and central Chile and have only four accepted species. Botanical Archetype – PERSONIFICATION, Soul contact and the embodiment of the spirit. Root Issue – ALIENATION, Divorce from nature. Lost and searching for answers on a never ending spiritual quest. Spiritual hunger and thirst that nothing ever satisfies. Divorced from your humanity, divinity and mother nature. Primary Emotion / Emotional Symptom – LOST SOUL. + Soul Contact, Soulful, Epiphany. – Soulless, Eclipse-of-the-Heart, Estranged, Missing, Yearning, Soul Searching, Journey, Quest. Lesson – Life is an experience. Not a journey. Ochagavia help to restore ‘soul contact’ and to begin looking at your life through the eyes of the soul. Ochagavia help you to ‘cross the spiritual desert’ and end the never-ending spiritual quest to find the spirit / person that you now are. Ochagavia help to embody your higher self by phasing out the ‘lower self’ caused by a faulty self image. A ‘Botanical Archetype’ provides background information about a plant family and its effects on the mind / body system. Author. Speaker. Human Being. Founder of the Skyflowers Project. 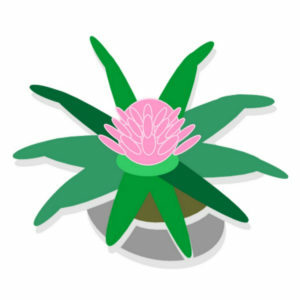 This is the botanical symbol for genus Ochagavia. It is found in all of our books, clinical manuals, flower notes and charts. Your purchase of any product on this website helps to fund further plant research. Thank you for your support. Learn why the Skyflowers are ‘Worlds Above’ in Flower Therapy.